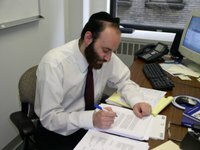 Rabbi Gil Student is the president of Yashar Books, a new Jewish publishing house, and the author of the Hirhurim-Musings blog. He studied in Yeshiva University and has private ordination. His publications include articles in newspapers and journals, and a book titled Can The Rebbe Be Moshiach ?